Are you thinking about replacing your traditional burner with a modern but heavy-duty gas cooktop? You can go for the GE Cafe 36 Inch Gas Cooktop Stainless Steel with Sealed Burners and Griddle. This GE CGP650SETSS is a great 5 burner gas cooktop from the GE Cafe gas range series. This GE gas stove is a mighty appliance to get over with the huge cooking chore of a medium to large family. In fact, this GE Cafe Gas Cooktop has acquired it’s position as one of the top-rated gas cooktops 36 considering design, performance, and durability. Do wanna get more information about this GE Cooktop including key features, pros, and cons? Have a look at the following sections targeting the 36-inch gas cooktop CGP650SETSS review. Hope it helps! The GE CGP650SETSS can assimilate itself with the trendy kitchen ambient featuring modern kitchen concept. This GE Cafe 36 Gas Cooktop’s design style might remind you the commercial gas burners. But this stainless steel gas stove bears the touch of modern style. This GE 5 Burner gas cooktop is blessed with a heavy and sturdy frame built with stainless steel. The structure holds five sealed burners, cast iron grates and a bunch of knobs made of stainless steel. The clever design allows the grates to form a leveled surface. What is more, the grates come with a continuous starburst-pattern. And, the triangular controls make this GE cafe 5 burner gas range look more stylish. This amazing product has literally changed the definition of conventional gas stoves. What makes a gas burner efficient is it’s formation and material of grates. Thanks to the manufacturer for providing heavy-duty Cast Iron Grates in this GE Cafe Gas Cooktop 36 Inch. These Cast grates are sturdy and spacious. They can hold the cooking pans firmly. Unlike the cheap burners, this GE 36 Cooktop‘s great construction features a trendy outlook. Another great this is each grate is placed nicely over the stainless steel perform. These cast grates are easily removable. So, you can enjoy effortless cleaning. The GE Café CGP650SETSS Gas Stove comes with a versatile combination through burner-size as well as heating capacity. 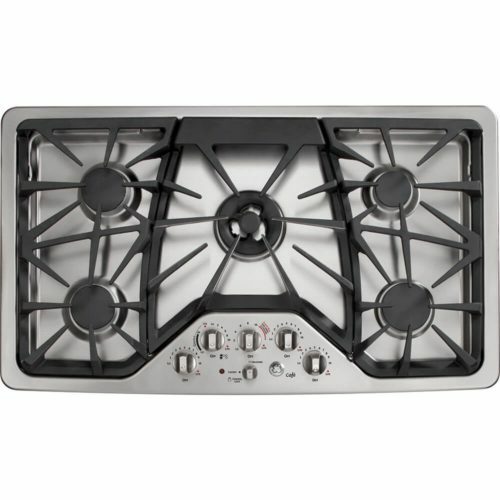 This GE Café 36 Gas Range Cooktop bears one standard gas burner on each corner with one burner in the middle. So, this GE Café range 36 cooktop includes 5 burners in total. These burners offer versatile thermal power measured in the British Thermal Unit (BTU). Among them, the center burner comes with the maximum heating-power featuring 20000 BTU. This GE 36 Gas Cooktop holds a tri-ring gas burner, at it’s central space. This central tri-ring burner can generate up to 20,000 BTU. So, it bears the largest size with the highest heating power among the five burners. This 3-in-1 burner has been designed for accelerated heating, as well as boiling. For instance, it can boil up a huge amount of water at a great speed. This GE 36 gas stove is also competent when your cooking needs a gentle simmer. Besides the 20k BTU powerful burner, this 36 Inch GE Cafe Gas Cooktop comes up with a precise simmering burner with the lowest heating power. It can deliver a low level of heat-setting of 140 degree-Fahrenheit. It is perfect for soft simmering, especially melting foods, like butter, chocolate, etc. The GE CGP650SETSS model is one of the best 36-inch gas cooktops available in 2019 for it’s spacious design which is accompanied with some handy accessories. It can make your cooking experience more flexible and convenient. Who can deny the efficiency of a Lodge cast iron wok to prepare the acidic food with great taste and browning. An exclusive advantage of buying this 36 GE Café gas range is that it comes up with the Lodge cast iron griddle with an adapter. If you own this amazing GE stove, you don’t need to buy an extra griddle. This integrated griddle saves your money. Moreover, the GE CGP650SETSS Gas Cooktop comes with an exclusive control dedicated for this nonstick cast iron griddle. The bottom-left control is designed to operate both of the left-side burners. What is more, the distant placement of the other burners helps the GE Cafe griddle to cook the food properly. You would love making pancakes, bacon, etc. diverse food for the kids using this GE Range with griddle. No matter how much cautious you are, the food might overflows sometimes. It takes less than one minute to overflow, but considerable time to clean up. But this GE Café cooktop can save your precious time and energy in the kitchen. But how? The magic lies in it’s clever design concept. The GE CGP650SETSS Cafe 36″ gas range features deep-recessed cooktop design. So, this GE gas stove can accumulate all the spillage – released by the five burners – on the stainless steel drip pan below the grates. After ending the cooking task, you can remove the grates and clean up the spillage food or liquid from the stainless steel platform within a minute. It is painless as well as effortless. One of the most amazing attributes of the GE Cafe 36 gas cooktop is that it offers sealed burners. This special construction keeps this 5 burner gas cooktop clean and safe for regular heavy-duty cooking. Let’s what benefit it does offer. Why to Use a Sealed Burner? A Sealed gas burner cooktop emits the open flames beneath the protective cap in lieu of diverting the flames directly to the pan-base. The sealed burner comes with a drip pan. It is sealed around the burner’s base area. It can store the spillage and prevents the burner-holes and grates from getting clogged by the spillage. So, the benefits of sealed gas burner is hard to deny, if you wanna keep your countertop clean. All the knobs of this GE café 36 gas range feature an organized and efficient heat control mechanism. The controls can respond instantly, which gives a faster heating. For instance, the center burner can boil up 6 cups of water in 4 minutes. In fact, this high-end GE Cafe Range CGP650SETSS model allows the user to have full and instant control over each burner. Like the pots and pans, the cast iron grates of this GE gas oven are safe to clean with a dishwasher. It is easy to separate the parts of this GE Café Stainless Steel Gas Stove. Isn’t it awesome? And to clean up the control dials and lodge griddle, you can use any dishwasher-liquid. However, the deep-recessed design of this GE 36 stainless steel gas cooktop CGP650SETSS hardly allows the food or oil spillage outside the burner. So, the cleaning task is easier for me. Sometimes the users forget to turn off the burners after cooking, due to stress or tiredness. Thanks to the manufacturer for the innovative design of this GE CGP650SETSS model. The GE café 36 Inch Gas Cooktop bears a bunch of knobs for controlling it’s five burners. These knobs are equipped with built-in blue halogen LED backlit system. As long as a particular burner is active, it’s associated particular knob will keep glowing. It serves as an indicator to remind the user that the burner is active. These blue LED back-lit knobs can catch your attention and remind you to turn off the burner. It may look a normal feature, but for me, it is a great safety option. Unlike the traditional gas stoves, the GE CGP650SETSS model redefines the safety mechanism of the gas range. This GE Cafe Gas Stove bears a lock-out control. This knob can disable the all other controls of this 36 GE five burner cooktop. This child safety lock feature offers a great help for the kids when you are busy in some other task and the burner is on the working mode. Not to mention kids often love to play with forbidden things. Now cook safely with the GE Cafe 36″ Gas Cooktop! If you are using another stove and want to replace it for the 36 GE Cafe Gas Cooktop CGP650SETSS unit, then you can take advantage of GE’s Fit Guarantee. It allows you to replace a similar stovetop from GE or any other brand. And you know what! The GE cooktops including the GE Cafe Range guarantees for a precisely exact fit which makes the replacement task quite easy. Package Dimension: 40 inches x 0.25 inches x 9.5 inches. Center Burner Power: 20K BTU. Accessories: Lodge Cast Iron Griddle with Adaptor. Warranty: 10-year on the Main Parts. The cast iron grates and the control knobs are a little bit heavy. The overall dimension of this GE Café 36 cooktop needs a spacious kitchen countertop to settle in and work safely. The GE Cafe 36″ Cooktop CGP650SETSS model offers great help to prepare daily family meals as well as home parties. It can cook at a faster rate than the average grade gas stoves. You can use different burners to cook several dishes at a time with proper taste and browning. Moreover, it saves time for cleaning. We recommend this GE café cooktop 36 Gas range for people who wanna enjoy the luxury of modern kitchen ideas. Where to Buy GE CGP650SETSS Cafe 36″ Stainless Steel Gas Sealed Burner Cooktop? Read Bosch 36-inch Sealed Burner Gas Cooktop review. Read Bosch 30-inch Seal Burner Gas Cooktop review. 5 Where to Buy GE CGP650SETSS Cafe 36″ Stainless Steel Gas Sealed Burner Cooktop?